SAN LUIS OBISPO, Calif. — (December 4, 2014) — The San Luis Obispo Marathon, Half Marathon + 5K presented by LeftLaneSports.com has posted four videos from local celebrity and U.S. high school running legend Jordan Hasay. Hasay, 23, who grew up in nearby Arroyo Grande and went to Mission Prep, is one of the most decorated high school athletes and was recently named to the California Interscholastic Federation’s 100th Anniversary Fall All-Century Team. The University of Oregon graduate now runs professionally for the NIKE Oregon Project and is coached by marathon great Alberto Salazar. 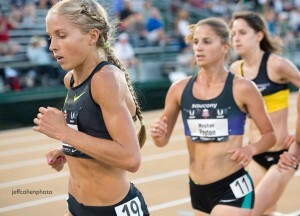 Jordan Hasay had a banner year in 2014 with two USA Championship runner-ups (5K and 10,000m) and personal records in the 800m (2:08.85), 1500m (4:07.70), mile (4:23.9), 2 miles (9:35.05), 5K (15:25), 5000m (15:29.63), 10K (31:39) and 10,000 meters (31:39.67). She is currently training for the 2015 season and dreaming of a Team USA berth for the 2016 Rio Olympics. The 2009 class valedictorian at Mission Prep also won four California state titles in cross-country and the 3200 meters as well as two Foot Locker National Cross Country crowns (2005 as a freshman and 2008 as a senior). The San Luis Obispo Marathon and Half Marathon presented by LeftLaneSports.com will be held on Sunday, April 26 and will take runners through the town’s charming downtown corridor, out into the hills of the renowned Edna Valley vineyards, then back into the city center and onto the iconic Madonna Inn property for a spectacular downhill, panoramic finish. The 5K and Children’s Quarter Mile Dash takes place on the Madonna Inn property on Saturday, April 25. Older PostThank You Riders, Volunteers and Sponsors!!! !